"BAMADVOCAST" was our first ever production. 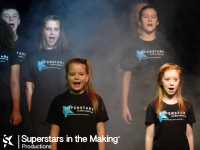 Superstars in the Making® opened in September 2009 and within 12 weeks, the entire academy (over 100 students) created a special welcome show. The name of the show was created by Nicola Bullen, and is an anagram of our course initials. This sell-out show was not only the debut of the academy, but was the first time "The Superstars Song" was to be performed. 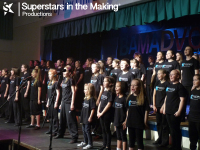 Created by Amy Whittle, this catchy song has become the anthem of the academy and is performed every year.